According to an entry in buildingsofireland.ie, this building ‘gives strong architectural definition to its context, and forms a landmark at a crossroads on the main Virginia-Cavan Road.’ Dating from c.1870, the house was probably built for estate workers employed by the Marquess of Headfort whose former lodge lies not far away. The building is particularly interesting because although looking like a single house from the front, it actually contained four residences, each with its own entrance. 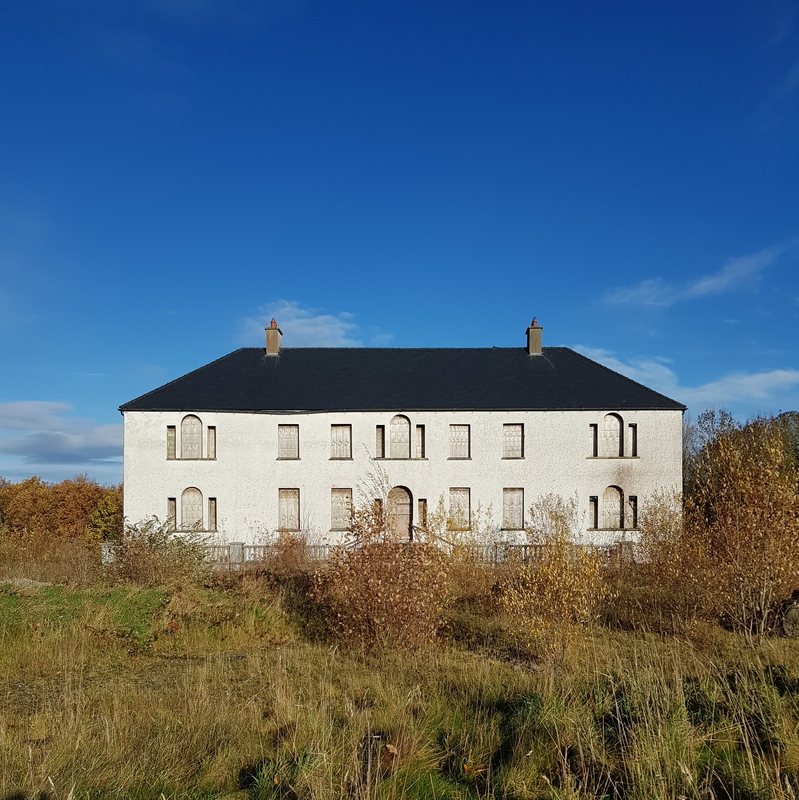 Given such a prominent position on the main road from the north into Virginia, County Cavan and the property’s historic associations its ongoing neglect is regrettable. Portlaw, County Waterford and its association with the Malcolmson family have been mentioned here before (see: A Shell, June 28th 2017). The Malcolmsons were of Scottish Presbyterian origin but in the mid-18th century one branch became members of the Quaker community. A son of this line, David Malcolmson, settled in Clonmel, County Tipperary where from 1793 onwards he became involved in the corn milling industry and enjoyed such success that when Richard Lalor Shiel visited the town in 1828 he could write ‘Malcolmson’s Mill is I believe the finest in Ireland. Here half the harvest of the adjoining counties as well as Tipperary is powdered.’ By that date the family, fearful that the Corn Laws (restrictions on the import of grain which favoured domestic production) were to be revoked by parliament, had moved into another business in another part of the country. In 1825 Malcolmson took a 999-year lease on a house called Mayfield and the adjacent 16 acres from a local landlord, John Medlycott. A small corn mill, damaged by fire, stood on the site and this was redeveloped as a vast, six-storey cotton mill, building a canal to utilize the power of the adjacent river Clodiagh. The enterprise required large numbers of employees and as a result the little village of Portlaw expanded rapidly. Around the time the Malcolmsons began work on the mill, it comprised less than 400 residents living in 71 houses: by 1841 the population of Portlaw had grown to 3,647 souls occupying 458 houses, most of the latter built by the Malcolmsons as part of a planned urban settlement. The family lived on the edge of the town and directly above the mill in Mayfield. The core of Mayfield was a classical house dating from c.1740 and it was here the Malcolmsons initially lived. However, in 1849 Joseph Malcolmson, who had assumed responsibility for the business, employed architect William Tinsley to enlarge the building. Like his client, Tinsley originally came from Clonmel and had built up a substantial practice in the area, so he was an obvious choice. However, by the time Joseph Malcolmson decided on a further expansion of Mayfield, Tinsley was no longer available: in 1851 he had emigrated with his family to the United States where he enjoyed an equally successful career before dying in Cincinnati in 1885. So in 1857 Malcolmson instead employed John Skipton Mulvany who specialized in a loosely-Italianate style architecture and who was responsible for giving the house its present appearance. Mulvany added many of Mayfield’s most striking features, not least a three-storey tower that served as an entrance on the house’s eastern front. This rises considerably higher than the rest of the three-storey over basement building which is of seven bays: the tower accordingly provided views both down to the factory and over to the village, allowing the Malcolmsons a paternalistic prospect of their workers. Mulvany was also responsible for the single-storey over basement wings on either side of the main block: that to the south served as a conservatory, that to the north held a pair of reception rooms. However the family were not to enjoy this splendor for long, the cotton factory which generated their wealth being ruined in the aftermath of the American Civil War (the Malcolmsons had extended credit to the losing side). In the last quarter of the 19th century the Portlaw factory was adapted for spinning but this enterprise didn’t last long and it was only in the early 1930s that a new purpose was found for the complex when it was acquired to act as a tannery by the Irish Leathers Group. Mayfield, which had for a period been occupied by members of the de la Poer Beresford family of nearby Curraghmore, now became an office premises for the new enterprise, and remained as such for the next half century. The tannery closed in the 1980s, and as a result Mayfield no longer had any purpose, although to the end of that decade a proposal was put forward to convert both factory and house into a retirement home. The scheme never took off and for the past thirty-odd years Mayfield has stood empty, falling into its present state of dereliction. As can be seen, little of the original mid-Victorian interiors remains other than fragments of plasterwork and rotting timbers. The exterior of the building has proven more sturdy, and retains the same appearance found in old photographs. But it is difficult to know what sort of future, if any, Mayfield might have. There is an old Irish expression Ní bhíonn cuimhne ar an arán a hitear, commonly translated as ‘Eaten bread is soon forgotten.’ Portlaw as seen today owes its existence to the enterprise and initiative of the Malcolmsons: what a shame that so little has been done to acknowledge their contribution to the area. Set into a wall to the immediate west of the main entrance into Mearescourt, County Westmeath is this pedestrian gateway. It appears to be a survivor from the main house at the end of the drive: this was developed over the 17th and 18th century around an earlier tower house and the building’s present front dates from c.1760. Probably when this work was completed and a classic Paladian doorcase installed, the earlier version was removed. However, rather than simply dispose of it, the owners recycled the stone here. 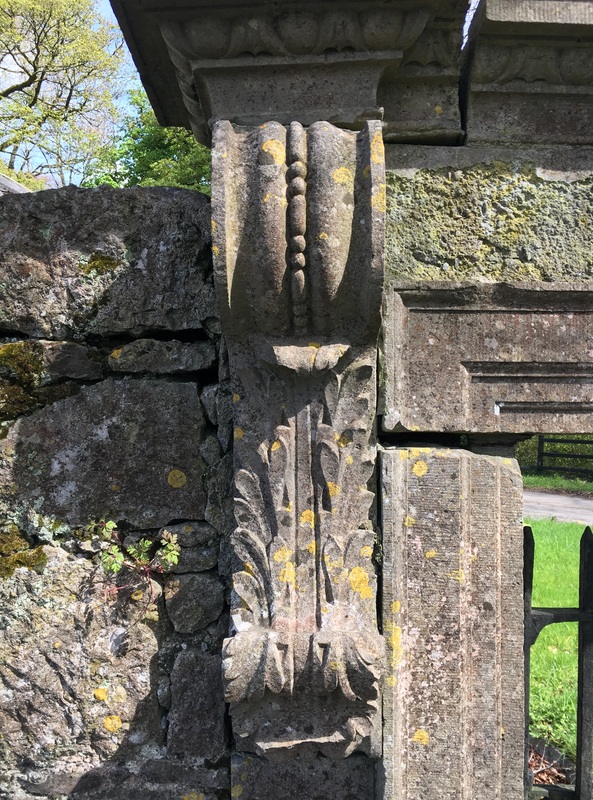 So this is a late-Baroque ashlar limestone doorcase with moulded architraves, the cornice supported by carved brackets, a rare survivor from the period although in need of some attention to ensure its future.